The Maril is a sporty hoody with a glitter two colored application along the hood and includes a velvet drawstring. 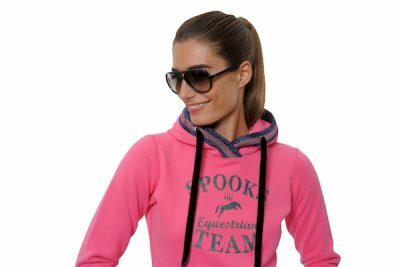 In addition, the hoody is printed with glitter Spooks logo lettering. A cute piece to complete any outfit for on or off the horse! • Washing instructions: machine wash at 30°C. Do not tumble dry.